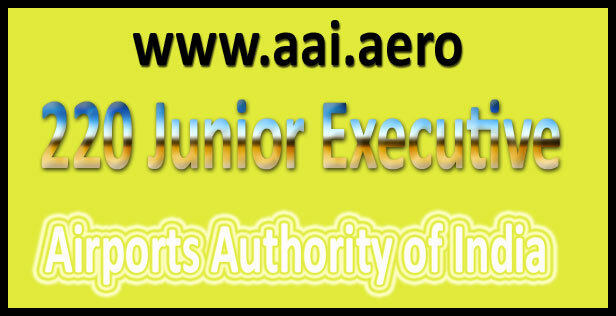 Online application form for [highlight color=”yellow”]AAI junior executive recruitment 2017[/highlight] available at official web Page of Recruitment Panel and eligible candidates can start filling online form for Latest upcoming junior executive Post Vacancy Notification from 18th April 2017, Link for filling up online form for AAI junior executive vacancy 2017 as we have mentioned below on bottom on this page, So fast up candidates and apply online application form for Jr executive Job 2017-17. Airport Authority of India has announced grand notification on its official website for the selection of 220 Junior Executive Recruitment 2017. AAI Recruitment 2017 is great chance for interested and fully eligible applicants of India. Job Hunters of India can achieve Junior Executive Posts easily. Job Seekers have chance to apply for AAI Recruitment 2017 from 18th April 2017 to 17th May 2017. This is the time to do various tasks like think about this post, apply and then start something to pass this exam. Applicant’s age should be at least 18 years for [highlight color=”yellow”]AAI Junior Executive Recruitment 2017[/highlight]. If you are genuinely serious for this post then you must think to get some knowledge of exam. AAI will organize Written Exam for Junior Executive Post 2017. Important dates to remember are also provided below. Don’t take AAI junior executive recruitment 2017 lightly otherwise you will regret in future. This is different recruitment; you will also need to do something different for this. Try some techniques to beat this competitive examination. At first, believe in yourself that you can get this post. AAI junior executive recruitment 2017 can be life changing moment because to get recruit as a post of Government Job is very huge thing and if you wanted to fill up online form for AAI junior executive recruitment 2017 apply online then link for applying online application form as we have mentioned bottom down on this Postalert Panel, Candidates can start filing online application form for AAI junior executive vacancy 2017 and complete recruitment process by downloading and attempt in the written examination then interview process. Education Qualification required: Candidates must have done Graduation Degree in Engineering/ Technology in Civil/ Electrical/ Computer Science/ IT/ MBA for AAI Recruitment 2017. Maximum age of OBC category applicants: 30 Years. Application fee for Junior Executive Recruitment 2017: Interested and eligible applicants should pay Rs. 1000 for General and OBC category applicants as Application Fee. No Application fee is required for other category applicants for AAI Recruitment 2017. Selection fee: Applicants will have to prove them in two competitive rounds which are Written Exam and Personal Interview round. Pay Scale: Salary of finally selected applicants will be Rs. 16400/- to Rs. 40500/- per month.